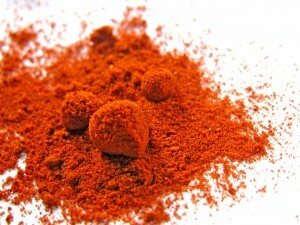 Paprika is a spice made from the grinding of dried fruits of Capsicum annuum (e.g., bell peppers or chili peppers). In many European languages, the word paprika also refers to bell peppers themselves. The seasoning is used in many cuisines to add color and flavor to dishes. Paprika can range from sweet (mild, not hot) to spicy (hot). Flavors also vary from country to country. According to Hindu legend, paprika is said to have been named after a religious Indian figure named “Rysh Paprike”. It has also been speculated that paprika is a derivation of the Serbian word ‘paprena’, which means ‘fiery’, then apparently forming it into ‘paprika’. An alternative claim is that ‘paprika’ is derived from the Latin ‘piper’ (pepper) through Slavic diminutive forms (‘pepperke’, ‘pipeka’), and came into currency in 1775. I’m not sure where this theory about the name of “paprika” comes from – the one minor fact that seems to be forgotten is where paprika is used most and how that is the word for pepper in that country, i.e. Hungary (by the way, I’m a bit curious about that claim that paprika refers to bell peppers in many European languages – I don’t know of any besides Hungarian). As for pepper and paprika, it is 99.9% probably that the two have the same etymological origins: they have the same meaning and same first three consonants… That said, the origin of the word pepper could be from a Hindu god, I won’t argue with that, but it’s more than obvious that in its current form the word for the spice came directly from Hungarian where the spice is most commonly used (and I say this knowing very well the cuisines of all surrounding countries – that also consider true paprika to be Hungarian). So I’m fine with speculation but it wouldn’t hurt to put down the leading theory. Anyway, Hungarian cuisine does not exist without paprika is like a fried chicken without chicken. We just pulled this straight from Wikipedia for this demo site, it wasn’t meant to be an official resource 🙂 I do appreciate you sharing the history and what it means to Hungarian cuisine with us!